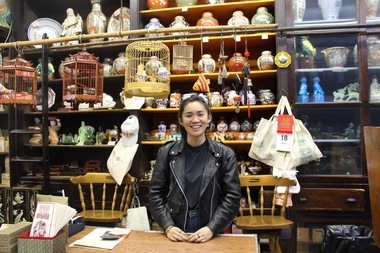 25-year-old Mei Lum now runs the antique store on Mott Street that has been in her family for 90 years. The panelists, many of whom are second- and third-generation Chinese Americans reviving old family enterprises, will chat about what they see as their roles in the neighborhood as it continues to change. “It’s about how we as community members can engage in the process of deciding what our neighborhood will look like a few years down the line,” said Lum. The fledgling passion project first began when Lum learned her family planned on selling the antique store and connecting building — her grandma, who had managed the store and building for over 50 years, was no longer able to play the leadership role, and the family had to either sell the business or pass the baton to someone willing and able to keep it going. Lum couldn’t bear the thought of losing the shop where she and her family had grown up — or the thought of a new landlord displacing the tenants that have lived above the shop for years. She eschewed her plans of attending graduate school at Columbia University, instead deciding to take the reigns and engage with the community as she strove to keep the business relevant. Lum chose to learn from her grandma the ins-and-outs of managing the store and followed in her footsteps. The transition was made official just last week. Lum now manages the store full-time, though she may return to graduate school sometime in the future, she said. The experience made Lum contemplate the rapidly changing nature of the neighborhood she calls home — other stores have not been so lucky, she said, and many have gone under as rising rents make it difficult for small businesses to stay afloat. Joining Lum for the inaugural panel are owners of egg waffle spot Eggloo, ice cream shop 10 Below, cycling shop Mott Street Cycles, new burger joint Breakroom, and Ami Li, a Chinatown-born gallerist who has transformed part of her father’s button shop into an art gallery. The panel, running from 6 to 8 p.m., will be moderated by Diane Wong, a doctoral candidate at Cornell University, who first approached Lum to interview her for her thesis on the gentrification of Chinatown. Lum says she is still planning out the rest of the summer series, which revolve around the theme “Chinatown Then and Now."